To eat. To talk. To bond. To be scared. To laugh. To yell. Hungry. 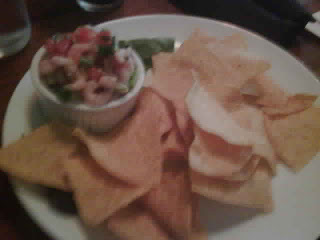 Pregnant with BLT and Bay Shrimp Ceviche. Satisfied with conversation. Scared of the clown. Laughing with the clown. Sad for the death of the clown. No more magic tricks ever. Still Have Open Dates on Your Calendar? Have a Cup of Discount with Your Scalp Massage. 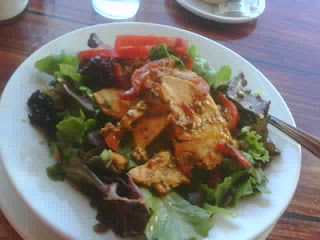 Ate Chicken Chipotle salad at Cup and Saucer Cafe. Good inexpensive, flavorful salad. Strange service, with a staring waiter. But I distracted myself by facing the window, entranced by all the diversity that wanders SE Hawthorne at night. Oh snap. Need a new purse. Mine is ragged. Crossroads Trading Company was still open. Great selection of name brand handbags. I fell in love with a smart purple bag with buckles. Granny or hip? Don't care. I'm getting it anyway. Heavy, real, purple leather. This will last me a long time. $25. That's a bargain. My hair is cut, massaged and product filled. My new purse is shiny and purple. My stomach is full. Hawthorne served me well. What are your favorite Hollywood kisses? 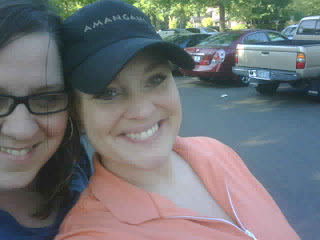 Once a month I treat myself to a massage from my good friend Lisa Still at HeartSong Massage. I've been going to her for about 8 years now and I was addicted from day one. She's a kick in the pants. Usually, I leave relaxed from a massage, and my tummy muscles sore from laughing so hard. Love. Her. Today I was a half hour late for my appointment. I told her to give me a shorty massage, so as not to inconvenience her next appointment. Lucky me, though, her next appointment didn't show up. So we went to happy hour. Of course. What else would we do? We headed over to Stanford's. Yes, a chain restaurant. The thing is though. They have a newish menu. At least since the last time I was there. Why not check it out, I thought. So, I ordered a virgin margarita, a chopped salad and the blue cheese and bacon chips to share. Lisa ordered a pomegranate martini and the chicken strips. We alternated between being engrossed in the dating rituals going on around us and texting/emailing/taking pictures and then sharing. We both have new BlackBerries. We were comparing. And observing Leathery Tan Woman #1 trying to pick up on Hot Bartender #1, who could have been her son. We laughed. Flirting is fun to watch. And hard to turn away from. Amazingly, there were actually two other Leathery Tan Women in the bar at the same time, but they had dates and were NOT trying to inappropriately pick up on young, vulnerable bartenders. Lisa received a lemon drop instead of a martini and it seemed as though the waiter thought my friend wanted a virgin drink, too (no pucker in the lemon). Silly waiter. She got a pomegranate martini later on that was appropriately potent. 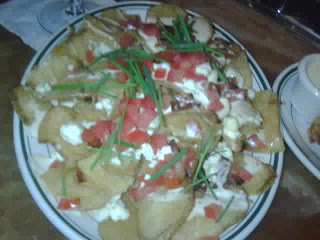 Chunks of blue cheese and crispy bacon with fresh chives and tomatoes on hot, freshly fried potato chips. The salt of the bacon + the creaminess of the blue cheese and the mild crunch of the chives with the hot potato crisps - it was a perfect marriage. Which is more than can be said about you people out there. Wipe off your chin. You're drooling. The rest of the food was good old bar food. Nothing spectacular, nothing horrible, nothing memorable. Besides the chips. But we've already discussed those. In the end, we promised to text more often, we hugged and parted ways. My next appointment is in less than 4 weeks. Can't wait. Climber + Derby + Tango Alpha Tango. August 5th. Doug Fir. $5. Priscilla Ahn. August 27th. Lola's Room. $12. Sondre Lerche. August 28th. Doug Fir. $13. Musicfest NW. Need I say more? September 3-6th. A few bands I am excited about: Port O'Brien, M. Ward, Vampire Weekend, Nada Surf. $50 for the whole damn weekend. The Raconteurs. September 16-17. Roseland Theater. $35. The Kooks. October 22nd. Crystal Ballroom. Is there a reason to EVER leave Portland? As much as I love summer, I always get a little excited about the fall. The back-to-school anticipation in the air, even for those of us that are done with school. Excitingly, there are so many things to look forward in the coming months leading into Fall. I'm helping with Wordstock this year, and it's going to be so great. And I just signed up to do another Write Around Portland workshop starting in September. The words are going to be all over my brain this fall. Will You Marry Me? Okay. Fine. Then take me to Lucier instead. "So I promised the valet that I would go back for a drink. You guys want to meet me there?" I was hesitant. The 4th of July. I was not dressed up. No, in fact, I think you could say that I was definitely dressed down. Lucier is rumored to have a dress code. And a river running through it. (Now that would be very Robert Redford-ish if there really was!) Not the place I would go in my grubbies after sitting in the dirt watching the fireworks on the waterfront. Laura seemed confident though - "Oh they'll let us in, it's just the bar." Why the hell not. Sure. Let's try it. We greeted the valet, who remembered Laura. Wait. Stop right there. If the evening had ended right then, it would have been enough. The valet was as hot as the 4th of July. And it actually WAS the 4th of July, so I can verify the accuracy of that statement. I reflected on my own appearance as I stared at him. The valet, darling as he was, assured us that we were not underdressed. "You know there's no dress code here. It says 'business casual', and this is Portland after all. You guys are fine." We wandered to the patio and I caught a glimpse of the dining room on our way. H. O. L. Y. Did the architects know they were building a restaurant in PORTLAND? The chandeliers, tablecloths and flowers made me cough a little and cover up, as if I was exposing some part of myself. We found the perfect place to sit - a couch and two cushy chairs around a coffee table. Mmmm. The menu was short. And French. My eyes went straight to the truffled parsnip chips (parsnip chips gratinees, black truffle-infused oil, bra tenero cheese). And some kind of fried cheese things (Fourme d’ambert cromesquis, fourme d’ ambert cheese croquette sauternes & honeycomb syrup). My friends ordered all manner of desserts. The waitresses all wore uniforms of silky/satiny halter tops, black slacks and high heels. Malibu Barbie was our waitress. The original Barbie was in there somewhere, too. But all the Barbies were nice and friendly and spot-on waitresses. I'm only calling them Barbies because I'm jealous. Truly. They were all as hot as the valet. I began to wonder: Am I really in Portland or am I on a strange drug-trip to 90210? Sigh. The food was A-mazing. The parsnip chips? Yah. Could have eaten the plate of them all myself and maybe even a second plate of them. The deep truffle flavor and salt permeated the delicate parsnips and it all came together with the cheese that was melted on top. Think hoity-toity nachos that rock. Thank goodness my pride was a little on guard that night and I refrained from the desperation-second-order. There was no need, really. The desserts, which included a black pepper cheesecake and jasmine creme brulee and then a chocolate fancy dish, had really interesting flavor combinations. I liked them and thought that the the pastry chef must be intriguing. I am really more of a salt person, though. I could have stuck with the chips and cheese and been so so happy. Instead, I pushed it a little farther and was stuffed. Right about the time I was going to go into a food coma, Malibu Barbie came by and told us that it was last call. Sara and Chelsea went to the bathroom and came back all agog and with a beautiful brown fancy-dinner-napkin like paper towel as a souvenir. As we were leaving, the waitress gave us a tour of the dining room. Gasp! There IS a river running through it. Not kidding. Well, it is really more of a trickle in a tiled moat around the dining room. But still. A river runs through it. She was talking about the symbolism of the different styles and walls and how it all reflects Portland, but I just kept thinking that I needed to run home and shower and put on some really nice clothes before I could understand anything that she was saying. It is really, really beautiful. The food is rich and flavorful and memorable. I really want to go to dinner there, but it's going to have to be an occasion that's worth it. This is not a Friday night, restaurant group kind of a place. It's a 50th anniversary place. Or a my book just got published place. Or OMG I just got a $5,000 bonus at work place. Or a marriage proposal place. But I don't put it past myself to dress up one night and pretend that one of those things is happening to me, just so I can eat dinner there. I am sitting here with all the windows open enjoying the breeze and the view of the Willamette River. And I am discovering blogging on my BlackBerry. 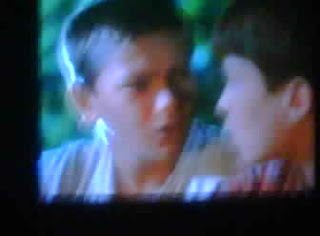 I am loving Stand By Me for the first time ever. This might be the perfect Friday night.